Why Is the Dialogue So Quiet on My HDTV? We’ve all been there: the characters on screen are talking and it’s way too quiet so you crank up the volume only to be blasted by a loud explosion two seconds later. Why is the dialogue so quiet and what can you do to fix it? Read on as we show you how to tame wild swings in TV audio output. Why Is There Such Variation In Volume? It’s a situation nearly everyone can relate to. You’re sitting there watching TV and suddenly the characters are talking in hushed tones about something important. You can’t hear what they’re saying very clearly so you turn the volume up until you can. Everything is perfect and you can hear their conversation clearly and then BOOM—a car crash, explosion, or sudden shift in action blows your eardrums out as the volume level skyrockets relative to the quiet conversation to which you were just listening. Why does it seem like so many TV shows and movies—especially action films—swing so wildly in volume levels? Unfortunately, it’s unlikely you can narrow down a common source of variable volume in different content to a single issue. Many can combine to create an annoying TV viewing experience. Let’s first take a look at of the issues that can cause this volume variability before we jump into what you can do about it. Audio is divided into channels. We dive into all the nomenclature of audio channels and speaker layouts in our guide How to Place Your Speakers to Maximize Your Home Theater Experience, but we’ll run you through a crash course here. Audio and speaker configurations are labeled by the number of different channels of audio present in the source. Headphones, regular TV sets, and systems with a pair of speakers (and no subwoofer) are referred to as 2.0 channel audio. The number before the decimal represents the number of full frequency range channels—so, regular front speakers, rear speakers, and so on. The number after the decimal represents the number of specialized, low frequency channels—output to subwoofers. So, if you add a single subwoofer to 2.0 channel audio, it becomes 2.1 channel audio. Add in rear surround speakers and a center channel front speaker, and it becomes 5.1. Add in two additional side surround speakers and you get 7.1 channel audio. Some systems feature an additional pair of directional surround speakers, resulting in 9.1 channel audio. And if you’re using an advanced system like Dolby Atmos, you might even see an additional decimal point followed by a digit representing the number of in-ceiling or upward-firing speakers—something like 9.1.2. In a 5.x, 7.x, and 9.x configuration, the sound effects (everything from the big booms to the faint creak of a door in the distance) are pumped through the front and rear L/R channels (depending on where in the “soundspace” the engineers want the sound to appear to the listener). You’ll note that we’ve made a lot of references so far to action movies. The phenomenon is radically more pronounced in action films and practically nonexistent in sources like sitcoms (aside from annoyingly loud commercials). In 2009, for example, audio engineers released a paper highlighting how movies such as The Matrix had a range of 25 units from the loudest to the quietest moments where as sitcoms like Friends had a range of only six units. Although we can point the finger at maniacal audio engineers in many cases, sometimes we can blame your television itself. Most people are not watching TV with extensive home surround systems. They’re watching TV with the simple 2.0 channel speakers built into the TV and maybe a 2.0 channel soundbar with a subwoofer added in for good measure to boost it up to 2.1. When you watch media encoded with 5.1 or greater channel audio (which is pretty much any DVD, Bluray, streamed source from Netflix, Amazon Prime Video, etc.) on a 2.x setup, it falls on the TV to perform a task known as “downmixing” to blend the channels together and re-balance sounds so that the 5.1 configuration sounds normal coming from a 2.0 system. Organizations like Dolby publish ratios that provide the ideal downmixing configuration with proper balance, but that doesn’t mean the people who designed your TV set followed the guidelines, or that your TV even has proper downmixing algorithms in the first place. Many cheaper TV sets just smash the channels together and push them out the speakers with little to no adjustment. That’s a perfect recipe for way-too-loud action and way-too-soft dialogue. Sometimes you can blame overzealous audio engineers, and sometimes you can blame cost-cutting television engineers. Other times, you have nobody to blame but yourself. If you have a multi-speaker system hooked up to a receiver, it’s on you to set it up correctly. If you’re using the wrong audio settings on your receiver and your channels are unbalanced or the settings intended to help equalize your listening experience are not active, then there’s a good chance you’ll be stuck with the same kind of experience you’d get with the cheap TV and no sound system. Now that we’ve got an idea how the dialogue and the action end up so far apart in volume, let’s look at ways we can remedy the problem. Although we’d love to walk you through the specific steps to fix your exact TV set or audio receiver, that’s a bit beyond the scope of the article. Instead we’re going to highlight common settings and solutions. We recommend you use the terms and concepts here to explore the settings menu on your device, or as a search term paired with the model number of your device to learn more. Many devices and services allow you to specify what your audio configuration is so that the device or service can either provide you with the right audio channel track or properly downmix it for you. If your Blu-ray player, for example, thinks that it’s hooked up to a 5.1 channel audio system, then it’s going to put out all 5.1 channels and you’ll be at the mercy of whatever your TV does with that output—maybe your TV will downmix it beautifully, maybe it won’t. If your player has the option to specify that the audio output is 2.0, then the downmix can be handled by the player and not the TV. 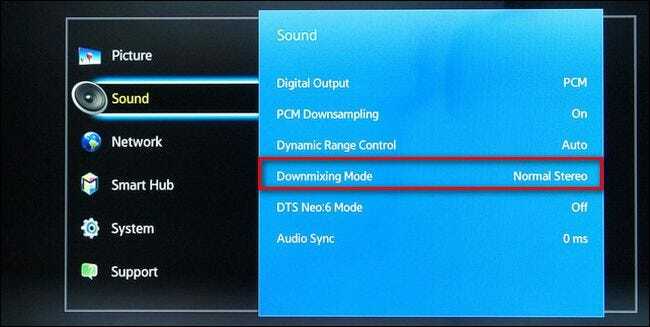 In the screenshot above (of a Samsung BD H6500 Blu-ray player), you can see the option labeled “Downmixing Mode” where you can specify how you want the Blu-ray player to downmix the audio channels for your speaker configuration. In short, you need to pore over the settings of the device and/or service providing the signal to your television (e.g. your receive, Blu-ray player, cable box, TiVo, etc.) and ensure that if there is an option to select the speaker configuration of the receiving device that it matches what your actual speaker configuration is (e.g. if you’re just using your TV then it should be set to “2.0” or “Normal Stereo” or the like). Normally, compressing audio is bad thing if you enjoy a rich and dynamic range. But sometimes, dynamic range has to come second to not waking up your neighbors—so dynamic range compression is a necessary evil. Labeled as “Dynamic Range Compression”, “Dynamic Range Control”, “DRC”, “Night Mode”—or (much less commonly) as “Dialogue Enhancement”, “Volume Amplification”, “Night Mode”, “Boost Downsample” or the like—this option instructs the device to compress the range of volume in the audio track of the displayed video such that the highest and lowest points are closer together. This makes the booms less boomy and the whispers less hushed. Using the same Samsung Blu-ray player menu, you can see the option above for “Dynamic Range Control”. Typical options are On, Off, and Auto. You do sacrifice fidelity to the original recording (loud noises meant to startle you during a spooky movie won’t be as loud, for example, nor will tiny noises be as tiny) but it allows you to watch an action movie once the kids are in bed without shaking the walls of the house. You can find dynamic range options on TV sets, on audio receivers, and within media center software (Like Kodi Media Center or Plex). If have a real multi-channel setup, you likely won’t want to turn on compression or enable stereo output just to fix the volume issue. Instead, you probably can just adjust the center channel volume directly on your receiver. Nearly every surround receiver on the market allows for channel-by-channel adjustments. Typically, you have to turn off any sort of special audio mode—like “Movie” or “Concert Hall”—and then manually adjust your channels. The instructions for your device should show you how. One way to approach it is to adjust the general volume up to the level that is comfortable for you in regard to the loud sounds in the movie or TV show (the explosions, the gunfights, etc.) and then individually adjust the center channel upwards until the dialogue is also at a comfortable level. Another method—known as negative equalization—is to leave the center channel set at its default, zero level, and then to adjust all the other speakers down. You can then turn the volume up to whatever you like. While the overall effect of making the center channel volume louder relative to the other channels is the same, this method can help alleviate the problem of getting too much hiss or other effects when boosting your center channel higher all by itself. The only downside of this method is that you might find yourself needing to adjust the center volume on a case-by-case basis. If you adjust it up for a particularly annoying action movie, you may find that the center channel—and thus, the voices—are too loud when you watch other types of movies. Armed with the knowledge of why the dialogue is so quiet and strategies for fixing it, you’ll never have to sit through another startling round of whisper-whisper-car-bomb-BOOM again. Have a tip or trick to help your fellow readers out? Hop into the forum below to share your media center setup knowledge.